Returning to work after maternity leave is an exciting time for some, but a stressful and sad time for others. I remember my first day back to work after maternity leave: I took my son to the sitter’s house, got into my car, and bawled like a baby. While I liked my team and was happy to be returning to my corporate strategy role, I was heartbroken to be leaving my little guy with someone else. Fast-forward to today, and I’ve successfully navigated my own maternity leaves, coached clients returning from leave, and supported countless friends through the process. While there are many things you can do to support a friend who’s returning to work, there are five main ones that will make the biggest difference. She may not be able to to envision what she needs, but trust me, the transition from being home with baby to going back to the office is tough. If she’s like most moms on leave, she’s doing the lion’s share of the household duties, including cooking, laundry, and running errands. By the end of maternity leave, many moms have developed a new set of habits and routines that are predicated on her being home and having control over her schedule. Showering, doing laundry or quickly preparing a meal while the baby is napping have become part of her routine. A rude awakening comes on that first day back to work. Gone are the days of taking a shower at noon or a nap at 4 p.m. if she had a rough night with the baby. Now, she’s having to get up, get herself work-ready, get the baby ready for a sitter or daycare and get out of the door early in the morning. She likely returns home that evening tired and desperate to spend some quality time bathing and bonding with her baby before the little one heads to bed. The flexibility she had during maternity leave has disappeared overnight; so, offer to stock groceries in the house, bring over prepared meals, process some laundry or send a cleaning service. Returning to work is often fraught with emotions. 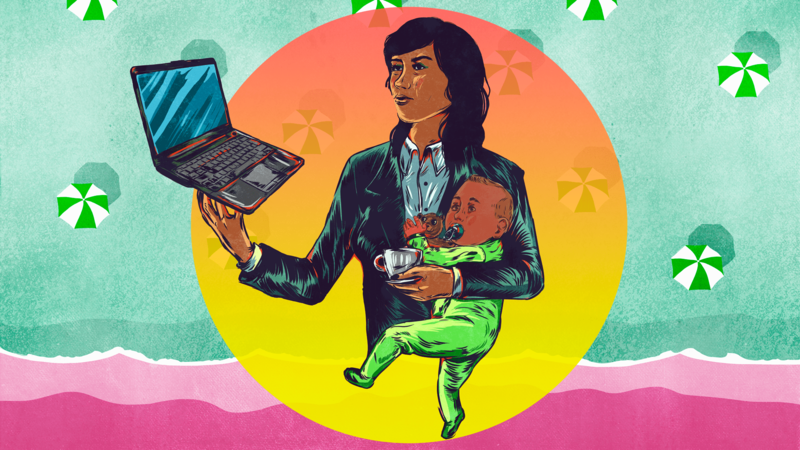 New parents are often simultaneously recalibrating the division of labor with a spouse or partner, spending less time with the baby, and juggling parenting with work responsibilities. Each of these can be tough. Your new mom friend may not ask for help, but she will appreciate it. So call to check on her — and listen. She will need to vent at times and process emotions. Offer advice where you can, but what’s more important is that you are there for her. Small gifts to brighten her space and make her feel special are appreciated. Framed pictures of her baby for her desk, accessories to make pumping at work easier or flowers and an encouraging note can all bring her joy. Once the baby shower has passed, and after friends have brought new-baby gifts, the attention that the family — and especially the mom — receives will dwindle. Small tokens of support and appreciation will be unexpected and go a long way. If she has to wear professional clothes to work, getting back into her work clothes — especially if she’s pumping — can be stressful and, for some, demoralizing. If you have clothes you can lend her, great. If not, researching and purchasing pump-friendly work clothes can be a game-changer. Your friend’s journey to juggling working motherhood will be a long one, but it will be worth it. Being a great source of support during her early days will be remembered and appreciated for years to come.